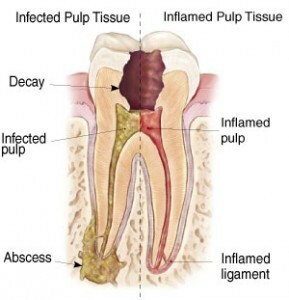 Root Canal Therapy also called Endodontic Treatment explained by Ballarat Dental Care dentists. Root canal treatment aims to remove the infected tissue in the tooth and keep the shell of the tooth, therefore preserving space, function and aesthetics. Sometimes, no symptoms are present. Root canal should be a preferred treatment option with our dentist Ballarat, as you can keep the tooth than to the cheaper options of tooth removal. The following issues can arise with tooth extractions. Root canal treatment cannot be guaranteed for lifetime. Root canal has a 95% success rate, if the treatment is done properly and it is adequately restored by the dentists. At times a root canal may need a re-treatment. Root canal treatment by Ballarat dentists may involve one to three appointments depending on the reason for treating the tooth. Root canal is not a painful procedure, but a long and complex procedure usually done for about 30 to 60 minutes on each appointment. If there are any difficulties or complications with the root canal, the patient is referred to a root canal specialist called endodontist.